Our replica Bell & Ross retreats into the history of timepieces to create more “vintage, original, and heritage” timepieces, we see an increasingly interesting range of retro designs as only Bell & Ross can do it. And now, our replica Bell & Ross has gone all the way back to the origins of the wrist watch with the “WW1.” The name means “wrist watch 1,” but not so ironically sounds like world war I. This is the era when wrist watches really began – so the name sort of has a double meaning. The WW1 is a different feeling Bell & Ross, and treads into new territory. 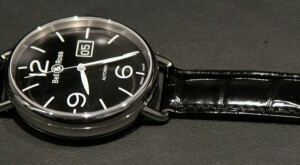 The concept of the piece is based on how some of the first wrist watches were modified pocket watches. To compound this idea, Bell & Ross has also released a pocket watch version called the PW1. The pocket watch won’t sell as well as the wrist watch, but is a good visual reminder of how you are meant to think of both pocket watch and wrist watch when looking at the WW1. Like a pocket watch the case is very rounded and pebble-like. This causes it feels less dense than much of what Bell & Ross offers. The steel case is polished all over and curved with a matching curved sapphire crystal. Lugs are done in the style of those that were once melted to the sides of pocket watches to make them wrist watches. Bell & Ross takes pride in this aspect of the watch and I think they did a good job with it. One cool aspect is that it is not a solid bar, but rather looks like one. The middle section is actually a spring bar – this makes changing straps much easier than if you needed to unscrew the bar. There is also a replica PW1 pocket watch, which is pretty large at 49mm wide and comes complete with a chain. The dial is polished differently with a sunburst style, and the caseback is machine engraved. Inside the pocket watch is a Swiss ETA manually wound 6974 movement. Both the replica WW1 and replica PW1 are interesting models, but our replica Bell & Ross has traveled so far back they no longer have any place to go with these retro models.